Bookstore-café owner Krissy Hancock has plenty to keep her occupied outside business hours, like preparing for her best friend’s wedding and solving a murder . . .
Krissy is meeting Vicki’s parents at the Pine Hills, Ohio, airport—it’s the least she can do as maid of honor, even if her relationship with Mr. and Mrs. Patterson is a bit strained. Besides, her own dad is coming in on the same flight. But there are a few additional arrivals, too. Her father’s brought a date—and the Pattersons, both actors, seem to have an entire entourage trailing behind them. Uninvited guests are a headache—especially when one turns out to be, allegedly at least, the most important wedding planner in all the world. Though Vicki and Krissy have already made arrangements for a small, simple party, Vicki’s snobby drama queen mother has her own ideas. Cathy the wedding planner is raring to go, possibly energized by the chocolate-covered espresso beans she compulsively munches. 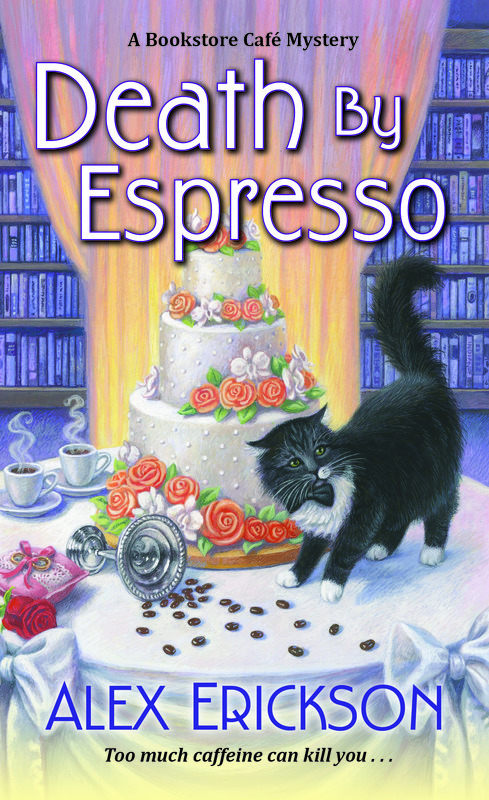 But while the caffeine keeps her awake, it doesn’t keep her alive—and after Cathy chokes on an espresso bean after being hit in the head, Krissy has to find out who ended her supposedly stellar career . . .